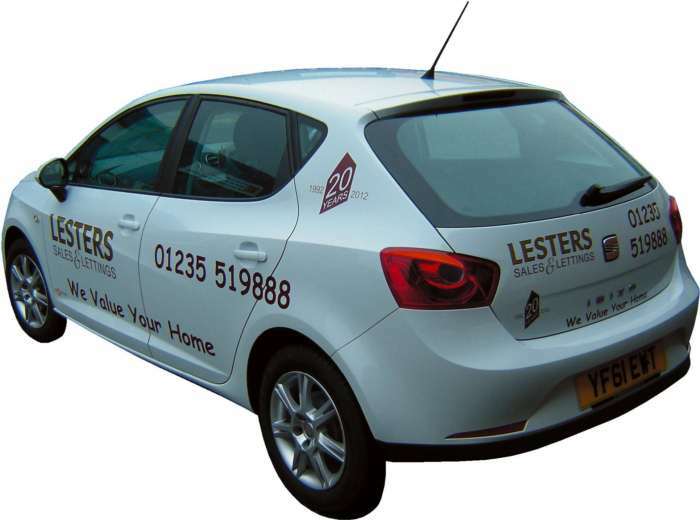 Winterbrook Estate Agents - News- Look Out For The Lesters Wheels! Look Out For The Lesters Wheels! Lesters Didcot office has taken delivery of their new office company car. With it’s distinctive styling and catchy punchline the vehicle will no doubt be a constant sight on Didcot’s streets. Branch Partner James Gesner commented; We have always been keen to look at alternative ways to get our message across, a few years ago both offices had Lesters Mini’s and they were a storming success and people kept asking us when we would be bringing them back! In fact they were used really successfully raising money for local charities with various events we held. We would also like to thank the team at Kingdom signs in Didcot for yet again another great job! So look out for our latest addition at the firm’s busy Didcot office the whole team are constantly using it on viewing appointments. If you want a free valuation as the car states ‘we value your home’ call the team on 01235 519888.